When I was 4 or 5 years old, my mother and I lived with my grandparents, James and Leila Malcolm, on Stock Street. My grandfather, whom I called Grandaddy was a wonderful and hardworking man. We had a special relationship. Grandaddy instilled a profound work ethic in me. You had to work hard for what you wanted to achieve. He taught me how to ride and fostered a great love of horses, something I enjoyed for most of my life. We rode together through much of Hanover and into the Pigeon Hills to look for arrow heads. Then, we would come into town and tie our horses outside of a diner and have lunch together. We rode and showed our horses at numerous horse shows including the one at the Hanover Fairgrounds. In 1936, Grandaddy bid on what would be the first Santa Cabin at an auction held by the Borough of Hanover. He must have kept it in storage for a few weeks prior to Christmas because it arrived Christmas Eve in our backyard. Settled next to our garage, it seemed like the Cabin had been placed with Christmas Magic. As my mother led me to the Cabin, who was inside but Saint Nick himself. I don't remember the exchange, but Santa told me he had brought this playhouse for me and I should share it with my friends. It is a wonderful memory of my Grandaddy's kindness. And did we play in that Cabin! My best friend, Barbara Keeney, (who later became Mrs. Charlie Markle) had curls like Shirley Temple and the two of us spend hours in the Cabin. We played dolls, had tea parties and for years, that Cabin was our refuge. We had neighborhood boys stop by to bother us--Glaynard Biddle and Punk Myers just wanted to see what we girls were doing in there. It was a great place for all of the neighborhood kids to share. One fall night, when we were 7 or 8, Barbara and I decided we would camp out in the Cabin. We marched out with my Scottish Terrier, Kilty, pillows, blankets and goodies to brave the night in the Cabin. We "roughed it" for a few hours until it really got cold and dark. Of course, the Cabin had no heat and wasn't insulated. I don't think we made it past 10 o'clock when we decided that Kilty was scared and came inside. From the time the Cabin appeared in my backyard until I went to boarding school, Santa never failed to come to the Cabin on Christmas Eve. Santa would appear in the Cabin and he would listen to my requests, wish my family a Merry Christmas, and rush off to deliver toys to all the children of the world. And I feel I believed in Christmas Magic longer that most children because of his visits each year. I left for Baldwin School in Bryn Mawr at 11 years old and when I returned that Thanksgiving, the Cabin was gone! Grandaddy told me that the termites had infested the playhouse and it had to be removed for fear of damage to the garage. What a loss! In many ways, the Cabin was a symbol of my childhood--full of friends, warm smiles, happy memories, fun and of course the joy and Magic of Christmas. Grover Gouker, alias Santa Claus, displays two fo the thousands of letters he has received from children from all across the country and overseas. 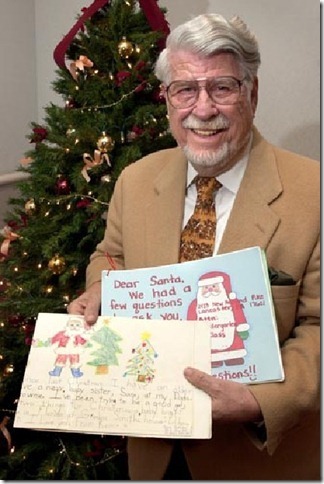 Mr. Grover Gouker, whose “Letters to Santa” Project was featured on the ABC program Nightline on Christmas Eve 2001. As a young Postal Service worker in Hanover, PA Mr. Gouker was heartbroken when he discovered that children’s letters to Santa were being thrown into the wastebasket. He began to answer the letters. Mr. Gouker became an author of two books, I Don’t Want No Soap, The Shortest Letter Santa Ever Got!, based on an actual letter from a young boy named Scott and My Santamental Journey, an in-depth look into Mr. Gouker’s 58 year “Letters to Santa”. Down York Street to the square on his special sleigh. To see Santa ride into town perched high upon his seat. Will bundle up in their mittens and scarves to stand in the cold. While watching the Christmas lights dance on the trees. For dolls, for bikes, for computers and trains. Where Santa will be waiting on you with holiday dreams to share! !